The D.H. Lawrence Ranch near Taos, New Mexico, is historically significant as the only residence the Lawrences ever owned. The property (formerly called Kiowa Ranch) also has the strongest association with the Lawrences compared to their other temporary lodgings in America. The Historic District meets National Register criteria A and B, in the area of literature, by representing Lawrence's foothold in America and relating directly to his contributions to American literature. An internationally acclaimed writer, D.H. Lawrence was especially known for his ability to capture the "spirit of place," and his vision of the American Southwest is best understood at the ranch and in its surrounding landscape.4 While he was living and working at the ranch during the mid‑1920s, it provided the scenic beauty coupled with harsh conditions that fueled his poetic imagination for such stories as "The Princess," "The Woman Who Rode Away," and St. Mawr. His experience in the Taos area also inspired many poems and essays, in particular a series about Native American Indians (now all being collected in Mornings in Mexico and Other Essays). The Pueblo dances that Lawrence attended and the Indian spirituality he observed are also translated into several scenes of his "American" novel, The Plumed Serpent (1926), which he began to revise while at the ranch. The Kiowa Ranch years (1924-1925) were Lawrence's most productive in America. The Kiowa Ranch was the closest Lawrence would come to setting up his dream of a Utopian community called Rananim(5), a collection of like‑minded artists and intellectuals interested in working toward a new way of life to combat the despair of a post‑World War I materialistic and mechanistic world. His influence, therefore, contributed to the development of Taos as an artists' colony by drawing famous visitors to the area during his lifetime and after. Lawrence's candor and integrity, his unique and intimate writing style, his eye for detail, his love of nature, and his mystic philosophy are all qualities that continue to impress and have impact on a new generation of American writers and readers. Thus the Lawrence Ranch District is significant at both the state and national levels. Although the restless Lawrence traveled twice again to Europe and was buried in Vence, France, his wife, Frieda, chose to return to the Kiowa Ranch soon after his death in 1930. Five years later Frieda had Lawrence's remains exhumed and cremated and his ashes brought back to the ranch. 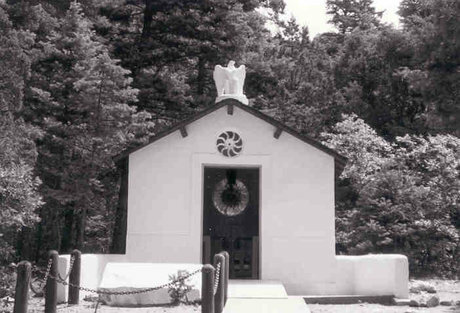 On a hill overlooking a view of the desert and the Rocky Mountains, she built the small memorial shrine to honor him (see Section VII) and later served as hostess to ranch visitors. She wrote her own recollections of her life with Lawrence, embodied in "Not I, But the Wind..." and Memoirs and Correspondence.6 And Frieda continued throughout the rest of her life to uphold Lawrence's reputation as one of the greatest writers of the 20th century.